Monsters continue to fascinate—as well as to plague and haunt imaginations. The psychic landscape is peopled with them; the social fabric is woven of them. This persistent, paradoxical repulsion and fascination with monsters and the monstrous begins, however, with causation. With the “birth” of each new monster comes a particular anxiety about its ability to self-replicate, generally through perceived “unnatural” means. The cultural imaginary remains obsessed with the origins and genesis of monsters. From whence do monsters come? How are they created—and more importantly—what is their reproductive potential? This interdisciplinary collection spanning the areas of history, literature, medical humanities, and film and media studies explores the transhistorical textual fascination with reproductive monstrosity and unnatural parturition. The collection’s four sections provide perspective on hyperbolic and monstrous representations of reproduction and birth that speak to anxieties and fears about gender and sexuality, codified through “unnatural” manifestations and their progeny. 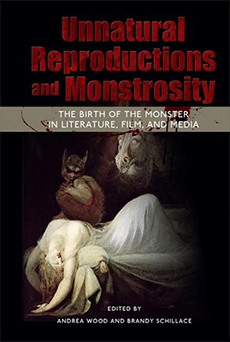 By focusing not only on the effect of the monstrous, but also on its reproduction in a variety of genres and modes from science to cinema, the essays in this collection offer critical insight into enduring questions about the genesis of monsters and their reproductive potential that have long haunted the world and continue to shape many fears about the future. This book analyzes how fears about unnatural reproduction and monstrous offspring—and their frequent connections to the feminine—have proliferated and propagated across the very texts which are repetitively created and consumed. Unnatural Reproductions and Monstrosity is an important interdisciplinary book for university library collections and scholars working in women’s and gender studies, film and media studies, history, literature, and medical humanities.